Free LibraryPlans of the proposed free library for Irchester have been presented by Messrs. Sharman and Archer, of Wellingboro’ and accepted by the Parish Council as satisfactory. The work is to be proceeded with at the earliest opportunity. The deed of gift of the land to be used for the building was also presented to the Council from Lady Wantage, and signed by the Chairman and members of the Council. The land given by Lady Wantage is on the High-street, and is now used as gardens for the tenants occupying the houses belonging to Lady Wantage. A special meeting of the Irchester Parish Council was held on Saturday. Present: Messrs. E. Parsons (chairman), G. Bowen, J. E. Parsons, F. C. Gray, J. A. Kemshead, C. Slater, J. Ashwell, C. Norris, P. Gardner, with the Clerk (Mr. Prentice). The tender of Mr. Packwood was accepted. The wish was expressed that as far as practicable work would be given to Irchester men, several of whom are at present out of employ. The Free LibraryLady Leigh, wife of Sir Chandos Leigh, K.C., K.C.B., of Knuston Hall, has accepted the invitation of the Parish Council to open the new Free Library at Irchester. The formal opening will take place on Saturday, Nov. 20th, and Lady Leigh will be supported by Sir Chandos Leigh. Mr. Charles Spencer has been appointed as caretaker, having been selected out of six applicants. The library is to opened daily from 11a.m. to 2p.m., and from 6 to 9 in the evenings, except on Thursdays, when the hours of opening will be from 11a.m. 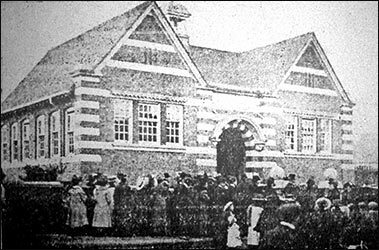 to 2 p.m.
A most interesting function took place at Irchester on Saturday afternoon, when the handsome free library, erected at the cost of Mr. Andrew Carnegie on land given by Lady Wantage, was formally opened to the public by Lady Leigh. The cost of the building was £1,000. The Free Library is prominently situated in the centre of the village, on the west side of the main street. The site was given by Lady Wantage. The building is approached by a flight of stone steps to a central stone-canopied entrance lobby, opening through swing doors into the hall, which is paved with marble mosaic. At the back of the hall is the librarian's counter, with office and store, etc. beyond. On the north side of the hall is the reading room, 30ft. by 16ft., with curved plaster ceiling, divided into bays by moulded plaster ribs springing from a moulded cornice. A moulded panelled dado is fixed round the walls. This room is well lighted, chiefly from the north. The room is furnished with three leather topped tables, each capable of accommodating ten readers, and at one end is a sloping newspaper rack. On the south side of the hall is the lending library, and also a room for the use of books of reference, which accommodates ten readers. The lending library is furnished with two double book racks standing in the centre of the room, leaving space round the walls for extension of book shelves as required in the future. The librarian is in direct communication with both lending library and reading-room. The building is heated with hot water pipes and radiators, and is ventilated by a large ventilator in a turret in the roof over hall. All floors except that of the hall are covered with cork carpet. The walls are papered and the woodwork is stained green and varnished. The front elevation is simple but effective in design, and consists of gable on either side of entrance, with stone cornices and stone bands in angle piers and pike. The three light gable windows have moulded stone cornices and cills and panelled rubber-brick mullions. The walls are of brick throughout, faced with Wellingborough bricks in the front, and the roofs are covered with small tiles. Messrs. Sharman and Archer, of Wellingboro', are the architects. The builders are Messrs. E. Brown and Son, Ltd., the plumbers' and painters’ work being executed by Mr. Nichols, of Rushden. Messrs. Marriott and Horrocks, of Higham Ferrers supplied and fixed the heating apparatus and pipes, etc. Note: A long detail of the Opening Ceremony is also reported.